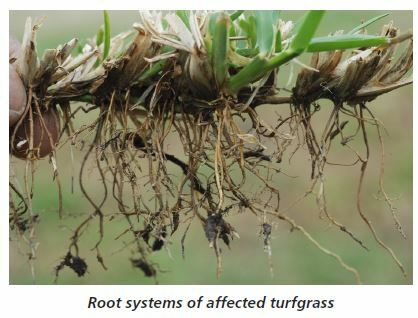 Take-all root rot, also known as take-all patch, is a common turfgrass disease in Louisiana caused by the soilborne fungus Gaeumannomyces graminis var. graminis, which is often abbreviated to Ggg. 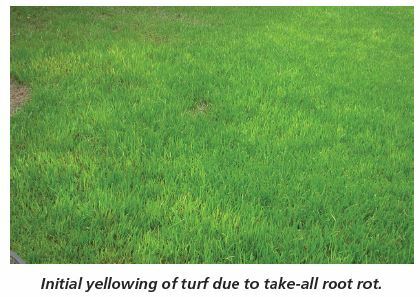 The initial symptoms of take-all root rot generally are visible as an overall yellowing and thinning of the turfgrass, which later turns into brown, irregular patches. Diseased roots are often short, dark in color and somewhat brittle. The overall density of the root system is also greatly reduced. Affected stolons can be easily removed from the lawn. 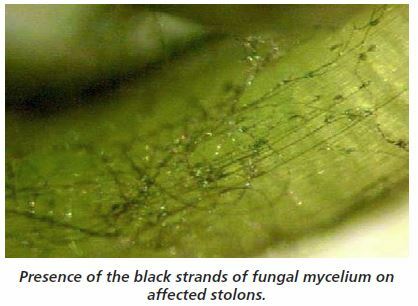 Careful examination of stolons and the base of the leaf sheaths with a good hand lens may reveal the presence of the black strands of fungal mycelium of Ggg on their surfaces. The appearance of symptoms generally coincides with periods of several abiotic stresses, especially heat and drought stress. 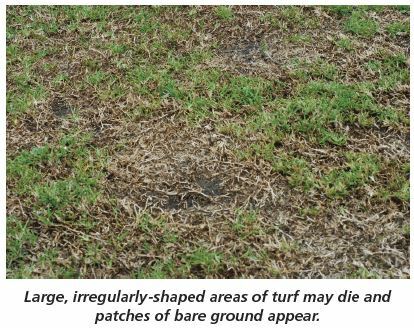 The disease commonly affects St. Augustine grass as well as bermudagrass.When affecting bermudagrass, the disease is often referred to as bermudagrass decline. Extended periods of rainfall are conducive for the disease. Soil pH above 6.5 favors disease development. Take-all root rot is a stress-related disease, and the following stresses may trigger the disease: soil compaction and poor drainage, drought, excessive irrigation, improper mowing height, excessive thatch buildup, improper fertilization, excessive shade and the overuse of herbicides. It is a root disease and does not affect foliage. Symptoms appear as an overall yellowing, thinning of turfgrass, which later turns into brown, irregular patches. Diseased roots are often short, dark in color and somewhat brittle. The overall density of the root system is also greatly reduced. Careful examination of stolons and the base of the leaf sheaths with a good hand lens may reveal the presence of the black strands of fungal mycelium of Ggg on their surfaces. Affected stolons can be easily pulled from the lawn. Symptoms can resemble chinch bug damage. Once foliar symptoms are observed, it is very difficult to control the disease. Management starts with cultural practices aimed to alleviate other abiotic stresses that weaken the turfgrass. Maintain soil pH between 5.5 and 6.0. Do not apply lime to affected lawns. Apply slow-releasing, acidifying forms of nitrogen and provide adequate potassium and magnesium fertility. Irrigate lawns as early as possible in the morning while taking rainfall into account. Water deeply and as infrequently as possible without causing drought stress. Raising mowing height will help the grass to recover and increase root growth. Avoid use of root-inhibiting herbicides. Excessive thatch can negatively affect turfgrass growth and provide a suitable environment for the pathogen. Dethatching may be necessary to improve turfgrass growth. In addition to cultural practices, fungicide applications may be required to achieve effective disease control. Always check fungicide labels for site application restrictions. When selecting products, homeowners must purchase fungicides that are labelled and recommended for residential lawns. When using fungicides, always remember to follow the label rates and frequency of application. Fungicides used to manage take-all root rot are sold under various trade names. They contain these active ingredients.